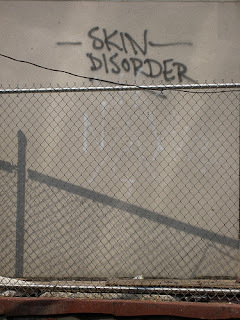 Yesterday’s post, and the discussion that followed, has me thinking about my own arbitrary classifications when it comes to graffiti and street art. 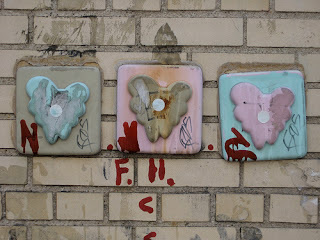 I generally put pieces I see on the street into one of three main categories. 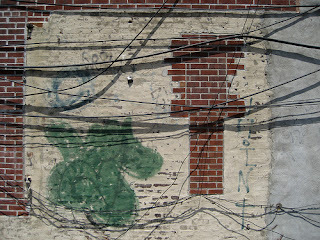 There are murals, which tend to be large, detailed paintings that are put up legally at the behest of a building owner. 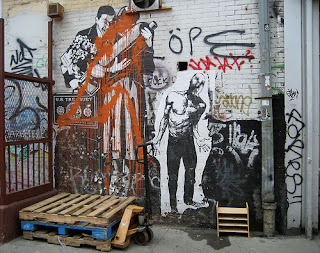 There’s street art, which is illegal and can be anything from pasted-up paper to small stickers to painted figures and stencils - always with some kind of pictorial or graphic element. Sometimes it's even sculptural, like the hearts above. And then there’s graffiti, which is basically everything else - tags, big bubbly “fills” and intricate, angular “burns,” scribbles of every kind. The lines between these categories are blurry and they sometimes overlap. But that's how I think of things. I tend to go for the illegal stuff - street art and graffiti. A mural is fine now and then, like the Os Gemeos mural I shot in Coney Island a few weeks ago (which you can see on my Flickr account). But I like the stuff that gets slapped up and may stay only a short time until someone else rips it down or covers it up. I’m generally not interested in big bubbly fills and burns, which I often have trouble reading. So there you have it, a big pie that I have arbitrarily carved into sections just to organize my world and my collection of street art photos. Silly, isn’t it? Especially since Zen teaches us that all the divisions created by our mind aren't really real. 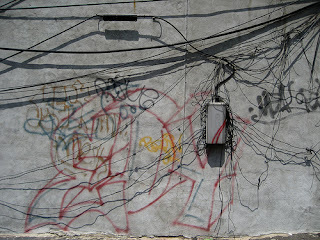 Graffiti is all one thing, neither good nor bad - except in my own head. James asked me yesterday about the so-called Splasher. Here’s the story. 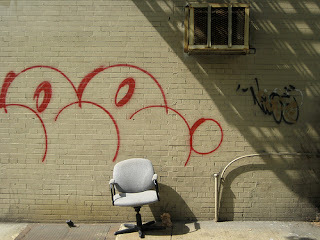 The Splasher - whether a person or group of people - has been destroying street art in New York. They hurl and splatter paint all over the piece and post a sort of collegiate, nonsensical manifesto next to it about the commercialization of art. This has been going on for several months now, with the attacks coming in waves. The Splasher seems to target big, prominent pieces - like the work of Banksy, which they demolished, and Obey (Shepard Fairey), above. Needless to say, this pisses people off. 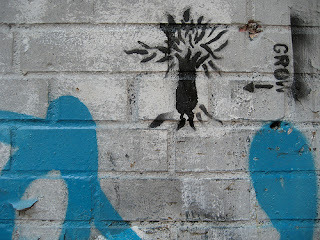 Some have argued that by splattering street art the Splasher is creating his own artistic statement. But I don’t buy it. I’m not sure wanton destruction of someone else’s art can really be called art in itself. Was it art when that crazy guy threw acid on the Mona Lisa years ago? Lately, the Splasher has been getting media attention - this article in yesterday’s New York Times and a recent piece in New York magazine. As the Times article explains, he may have just been caught. But that won’t stop copycat splashings and other mischief, so no one’s really sure what will happen from this point on. Still, keep your fingers crossed that the Splasher’s splashing has come to a halt. I feel a little bit as if I’ve dropped into a black hole for the past week. The office move took up so much of my time and energy that I haven’t been able to do much else. I did get out and take photos on Saturday, and of course there was the parade, but I haven’t been sitting at all. I’ve missed my quiet time to reflect and collect myself. I did watch a great old film two nights ago: “Forbidden Planet.” Remember the chorus from the song “Science Fiction Double Feature” from “The Rocky Horror Picture Show”? Anne Francis stars in "Forbidden Planet"
Ever since I first saw “Rocky Horror,” I have wondered about “Forbidden Planet.” So I rented it, and what an awesome old sci-fi movie it is! From 1956, it’s more than just a yarn - it has a message, like a lot of the old “Star Trek” shows. Highly recommended! I’ve also learned that one of the theaters here in New York has a midnight showing of Rocky Horror on weekends. I haven’t seen it in a theater for 20 years or so. I might just have to go - if I can stay up that late. Some of you asked for a peek at my new office. I took some photos yesterday, but the ones of my actual desk area fail to capture the beauty of the building. Something about cubicles - no matter how nice, and they are really really nice - just isn't very inspiring. This, however, is the cafeteria. You can see the beautiful light and the shadowy effect of the sunscreens on the outside of the building. 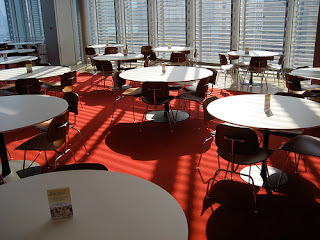 Our previous cafeteria had big windows, but having big windows in a solid wall is just not the same as an entire wall of glass. 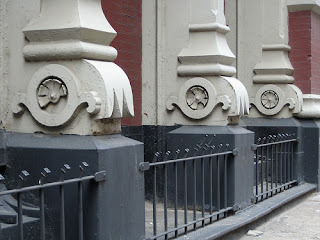 By now, all you New Yorkers probably know which new building this is. The architect is Renzo Piano, who also recently created a beautiful addition to the Morgan Library. Piano designed this building to be open and transparent, so many of the inner walls are also glass. Everything has a very clean look. I find it an incredible place to work. Unfortunately, I've been caught in bureaucratic hell trying to get one of my computers hooked up. It's a long, boring story, but fortunately the problem should be solved today. No move is without its glitches! We’re ensconced in our new office and I’m happy to report that the glass palace is pretty amazing! The light in the office is pleasant and the views are spectacular. The space is much better than we feared it would be, too - our desks are big enough to accommodate our stuff and not make us feel cramped. 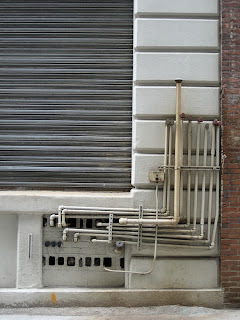 Some of the building’s “smart” features are a little bizarre. The lights sense when they need to come on, and the sunshades move up and down automatically depending on the light’s intensity and direction outside. Consequently, they seem to be moving around a lot, as the sun disappears behind clouds and moves across the sky. In a way maybe that's good, though, because they remind us to notice the changing light. We're so much more connected to the external world in this building than we were in the prior one. I’m so happy to be in a new, modern space! Well, Hillary was a no-show. See? You never know what to expect from the Pride Parade. I met up with my friends Rob, Dan and Jimmy to watch yesterday’s festivities. We gathered at the corner of Fifth Avenue and Eighth Street, which put us completely by accident at a strategic spot, where the parade turned to go into Greenwich Village. There were marchers from churches and synagogues. (No gay Muslims, though - at least not that we saw.) There were floats carrying elaborately dressed Peruvian gays and Brazilian gays and Venezuelan gays and Caribbean gays. There was a float for a Mazda dealership in New Jersey. Apparently, pretty much anyone can have a float in the Pride Parade. Sure, it’s all a little nutty, and quite a bit over the top, but a little celebratory nuttiness is called for now and then! Today is the gay pride parade here in New York, which promises to be a spectacle, as always. I'm going to meet some friends in the thick of things, down in Greenwich Village, and watch the weirdness. Where else can you see Hillary Clinton and muscley guys in Speedos - together? Have you ever seen those post-apocalyptic movies that depict a collapsed society, where normally valuable things have become valueless and a few scattered survivors scavenge among the relics? That’s what my office has been like this week. Virtually everyone had already moved out of our building, and we were among the last few people on our floor. Each day on Thursday and Friday I went down to the main office area, which had already moved, and walked through the wreckage of dusty desks, abandoned chairs and heaps of unwanted or outdated office supplies. People left an assortment of personal oddities behind - coffee mugs, old jackets, a sparkly pair of Steve Madden shoes. There were dozens of florist’s vases, remnants of bouquets delivered and now long dead. I did take to scavenging, grabbing a package of copy paper here or a box of paper clips there. It seemed a shame to leave useful things behind. Periodically I saw other wanderers across the room, picking through the debris on their own. Now, even that post-apocalyptic period has come to an end. Friday was our last day in the building, and in the afternoon all our stuff - including my scavenged paper and paper clips - went into big plastic crates. We worked as best we could at empty desks, and then went home. On Monday we report to the new glass palace in the sky! The New York Times had an interesting article yesterday about “freegans,” or people who live intentionally off other people’s trash. I can dig that to a certain degree - I’ve certainly picked up my share of cool stuff from the sidewalks of Manhattan on trash day. The freegans (here's their Web site) go dumpster-diving together at places where there’s likely to be good trash - outside NYU dorms at the end of the semester, for example. They find furniture, art and working televisions. It’s amazing what people throw out. The freegans go a little too far for me, though. They even eat out of the trash, retrieving discarded food from supermarket refuse. They’re making a comment about our wasteful society, and it is remarkable that people can live pretty well off what their neighbors throw away. Are Americans wasteful? For sure. But I’m not sure being a “freegan” really changes the system or makes an effective point. I like the fact that they’re using what would otherwise be wasted, but they’re still living off the same wasteful society. I think a better answer is to buy carefully. Go ahead and consume, but use restraint in your consuming. Then you’re using your economic power to direct the market toward fulfilling important or essential needs. And on that subject, I found this very interesting set of maps on Flickr. Check them out. They’re quite illuminating. Packing up the office to move has been an interesting experience. I love moving, so for me the task has been tinged with excitement. We’re moving from an exceptionally old office building - with its exceptionally old plumbing, exceptionally old elevators and exceptionally old tile, paint and linoleum - into one that is brand-spanking-new and designed by a famous architect. The new space will be very sleek and minimal, and unlike our current quarters, the walls will be entirely glass. How could such a change not be exciting? I asked her why, and she said she’s sentimental. She finds it painful not only to leave our old building, but to clean out the accumulated stuff on her desk. 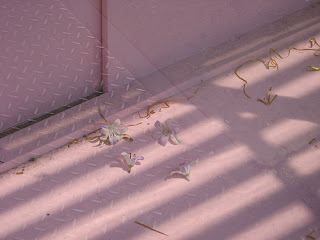 Throwing things away, for her, is an arduous and even emotional task. For me, it’s cleansing. It’s a chance to get rid of stuff that’s been lying around for years - the posters from the editors’ meeting in 2000, the office supplies that weren’t quite right, the stacks of bizarre plastic attachments for the slow, ancient printer that we’re leaving behind. I will be thrilled to have all this stuff out of my life. To me, it feels like a progression, a step ahead, to clean things out and start anew in a more modern space. To my coworkers, it feels like a loss. My challenge has been to understand where they’re coming from, and - as move coordinator for our office - not pressure them too much. I’ve let them handle their packing and organizing at their own pace. I do wish they could be as happy about this move as I am, though. I wish they could see it as a gain, a chance to trade dowdy brick walls for a bright new vista of glass. I had my own little health scare last week, which I inadvertently revealed to some of my regular readers. (You know who you are!) I learned a couple of things from this experience: 1) never diagnose yourself, and 2) never write something on the Internet that you expect to keep anonymous, because SOMEHOW it will be linked back to you! Anyway, yesterday my doctor told me I’m fine. Whee-yew! Buddhism has guidelines, known as the Ten Grave Precepts, that offer adherents a path to walk while minimizing harm and delusion. They’re sort of like the Ten Commandments, but maybe not as commanding -- they’re guidelines, a framework for living life, as opposed to strict rules. Not killing. Not stealing. Not lying. Not gossiping. That kind of thing. I thought about this precept after my outing on Saturday night, where I certainly had more than an adequate amount to drink. I wasn’t sloppy drunk, but two drinks is about as far as I usually go -- any more than that and I’m pretty much over the edge. On Saturday, over the course of the evening, I had two gin & tonics and about five glasses of wine! No wonder I felt fuzzy the next morning. My theory on drinking, like most things, is that it’s a matter of balance. I mistrust absolute rules, because there are always situations that demand that they be broken. For example, if I’m out with friends and they toast someone’s birthday, I’d like to preserve the balance of the occasion and share the drink. Even dining with friends who buy a bottle of wine, I like to share in the bottle. It’s about the fabric of the companionship, and not making an issue of my ideas and beliefs. I think a glass of wine or two, on occasion, is utterly harmless. It’s only problematic to drink habitually, to run away, or to the point that you literally lose your mind. I think I can be mindful even with a glass of wine in me; but probably not with five glasses! Anyway, I’m not doing that again anytime soon. I wasn’t really hung over -- not like I’ve been in college -- but as I went to the Zendo the next morning, I didn’t exactly feel like my normally unclouded self! 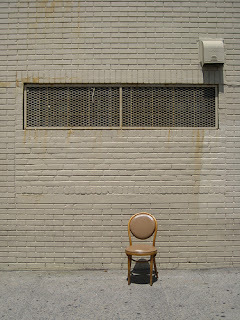 I was walking to the gym yesterday morning when I saw this wall, with the abandoned chair next to it. I had to run back to my apartment for the camera! There's something really photogenic about chairs, and I'm not sure what it is...they're almost as innately interesting as doors. This wall is unusual because it never really changes. 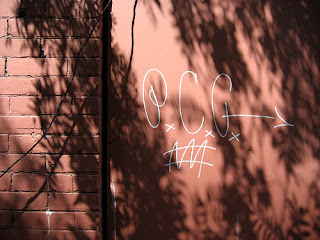 As the tide of graffiti ebbs and flows, this wall remains pretty much unaffected. Here is a shot from last summer. I went out last night with my friend Jan and her friend Helen to a great restaurant in the East Village called the Mermaid Inn. The three of us drank two bottles of wine, plus a couple of cocktails. I'm definitely feeling it this morning. Still, I plan to get to the Zendo and rebalance! 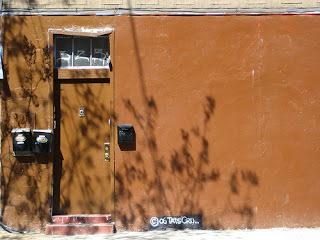 There's a little graffiti battle going on in this niche on 24th Street in Chelsea. 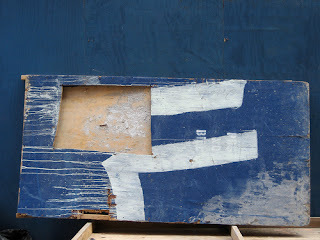 You may remember this photo, showing a big piece of street art that had been plastered over the orange tag. Well, the tagger has returned and painted over the street art. You'd think in New York there would be enough wall space for everybody, but I guess this is really about respect. Our unseasonably cool weather seems to be continuing, so I have not yet had to turn on the air conditioner. I think my fear about birds in the a/c unit is unfounded, fortunately. I've heard scratching on only one day in recent weeks, and I've heard absolutely no sound of baby birds. I think a sparrow or finch just pops in there from time to time to look for bugs. I've felt very scattered and distracted over the last week. Our office is moving, so I've been trying to get things packed up and ready to go (we're only moving a few blocks away, fortunately). Of course I had my visitor (Mom), and on top of that my cat seems to be having some more health issues. I'm hoping it's temporary fallout from her radiation treatment, but for now we're in "wait-and-see" mode. I'm hoping to use this weekend to decompress! In Coney Island, we had an obligatory walk on the beach. We went down to the waterline and I stuck my fingers in - it wasn't as cold as I was afraid it would be. The beach is wide and pretty clean, considering all the people who congregate there, but you've definitely got to keep an eye out for the occasional piece of broken glass. I forgot how harsh the sun is on the beach. I usually wear a hat, but I often don't cover my arms or my neck when I walk around in the city, and I seldom get burned. On Coney Island, though, in a relatively short period of time, I got a bit red. The temperature in New York has been freakishly cool the last several days. I actually wore a jacket to work yesterday, which is unheard of in the middle of June! It's nice to not have to turn on the air conditioner, though. When Mom and I were out on Coney Island, a lot of the amusements were closed. As I mentioned before, we were there on Monday around noon - not exactly peak time for the attractions. 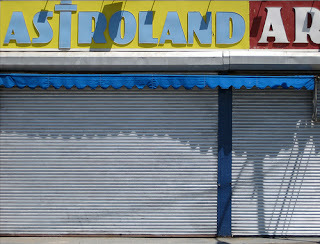 The Astroland amusement park had some folks in it, but many of the arcades were shut down. Astroland is supposed to close permanently after this summer. It's a very old-fashioned sort of carnival midway, with rides and games and stuff like that. A developer has plans to make the area more upscale. Right now it's definitely the land of cotton candy and tattoos. The legendary Cyclone, an old wooden roller coaster, will remain. I'm not sure about the Wonder Wheel, but that's historic too, so I imagine it will carry on. I think this aura of age and decline is what led my Mom to call Coney Island "sad." 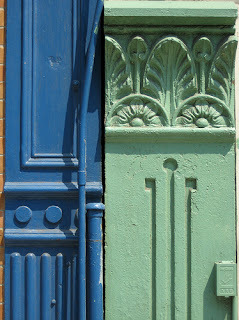 But it also has a kind of nostalgic charm. Even the name - Astroland - sounds so 1957, full of mid-century hopefulness and optimism. I found this stencil on a mailbox over the weekend, and it seemed appropriate because my Mom and I had been talking about this very idea: leaving a mark on the world. Our conversation was inspired by our visit to The Cloisters and all its medieval art. We talked about all the nameless people who lived when the art was created, who worshipped it, who were born and died during the 100 years between one piece and the next and in the hundreds of years since. They lived in complete anonymity, and when they died, and those who knew them died, they utterly disappeared. The next day, on the way to Coney Island, we passed a cemetery where headstones were packed together so tightly that it looked like an aerial view of Manhattan. Burial in general is a disagreeable notion, but headstones seem like pure folly. Why do we all need our own little rock? Do we think it will prevent us from being forgotten? Who are we kidding? I've always liked the idea of just disappearing. When I die, I don't want a headstone. 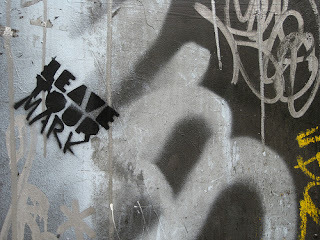 I don't want to leave a mark. I want to be like all those anonymous millions who lived before and rejoined the vast pool of the cosmos when they died, without holding on desperately to the illusion of a permanent, individual identity. Some might call me morbid, but I think vanishing is a beautiful concept. This was the scene that Mom and I stumbled onto on Saturday, when we went to Madison Square Park and found it packed for a Barbecue Festival. 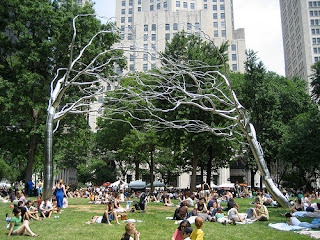 I was especially impressed with these stainless steel tree sculptures, the work of sculptor Roxy Paine. They'll be in place through December. They seem wintry, so it will be interesting to see how they look when the leaves drop in the fall. I just put Mom in a cab, headed for the airport and home. We had a good time. Yesterday we took the subway out to Coney Island, which Mom pronounced "sad," and indeed it does look somewhat downtrodden. We got Nathan's Famous hot dogs and sat on the boardwalk next to two leathery old guys, one named Murray, who immediately started feeding old bread to a cacaphonous flock of seagulls. Mom does not share my fascination with street art, but she very patiently put up with my photography, so I got some good shots of Coney Island. More to come! Yesterday Mom and I went up to The Cloisters, the Metropolitan Museum's showpiece of medieval European art and architecture. It's located at the northern tip of Manhattan, so we climbed on the A train with some rowdy teenage revelers from the Puerto Rican Day Parade and zipped northward. It always amazes me to see art that's been hanging around for 800 years. Thank goodness for churches, where things were tucked into closets or venerated on altars and thus well preserved. We saw the famous unicorn tapestries, which show hunters tracking, capturing and killing a unicorn - a Christian allegory. They're probably the most famous artworks up at The Cloisters. Now here's some bizarre graffiti. Is this someone's street name? If so, maybe I'd rather not meet them. Last night I took her to a restaurant near my house called "Country" that I've wanted to try. I had quail, which I've never eaten before, and I have to admit it made me feel awfully guilty to see that poor little bird sitting on my plate. A chicken seems so much less vulnerable! 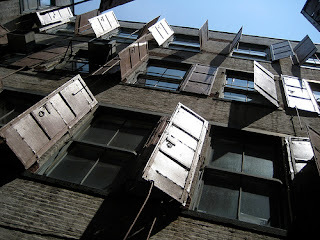 I found this door in an alley, but I can't remember exactly where. 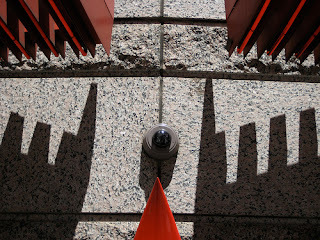 It normally goes in one of those blue plywood barrier walls that surround construction sites. My Mom is visiting this weekend. She flew in yesterday and in the evening we sat on the bench in the courtyard behind my building, enjoying its serenity amid the trees and the pigeons. I told her how quiet my apartment is and how much I like living in the back of the building. Then, wouldn't you know it, someone across the courtyard had a blowout party that lasted until 5 a.m.! Only when the sun came up did they finally disperse. Before that, they sang "Happy Birthday" at the top of their lungs, played Sinatra's "New York, New York" several times and yelled obscenities at a neighbor who opened his window and told them to pipe down. At one point they broke a bottle and I decided to call the police - but when I walked around the block to see which building address to report, the police were already there. 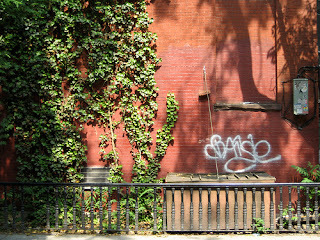 After I met Reya and Ched for lunch on Wednesday, I walked back to the subway and passed this fantastic wall. It's come a long way from its appearance a year ago. The big paste-up is by WK Interact. 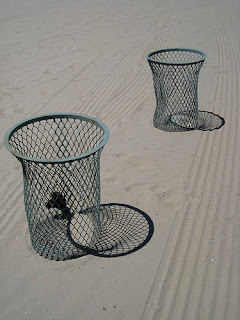 My lunch conversation with Reya and Ched touched briefly on koans, the Zen riddles I'd written about a few days before. They were both curious about the nature of koans, and I gave a kind of bumbling explanation. Here is an effort to clarify. A monk asked Master Joshu: "Does a dog have Buddha-nature?" In considering this koan, the practitioner meditates on Joshu's message. What is Mu? What did Joshu mean by that response? Once again, I am not an expert on koans. But my understanding is that while meditating, the practitioner literally breathes "Mu." By coming back again and again to that word, almost like a mantra, and considering the meaning of Joshu's answer, he or she opens up to a new way of thinking. Or maybe really non-thinking, because it's not literal or cerebral, but much more visceral. The practitioner goes back to the teacher with an expression of that realization, and the teacher may or may not accept it. I've mentioned my own reluctance to start a koan. In fact, I'm about to embark on Mu, which fills me with trepidation. Especially since I have trouble even with a very general explanation over lunch! 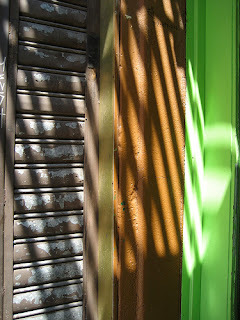 I took this in Hell’s Kitchen yesterday, as I was walking around town with two fellow blog buddies, Reya and D. Chedwick. 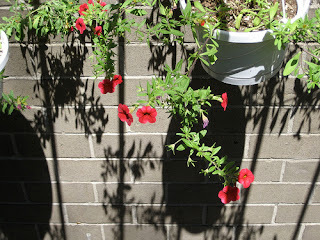 We all liked the feathery shadows. 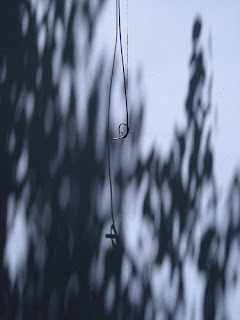 One particular kind of street tree in New York - I think it’s a locust - casts these shadows. Let me just say right off the bat how great it was to finally get a chance to visit with two fellow bloggers! Normally in the blogosphere you labor away in physical isolation from your compatriots, commiserating solely via the Web. It was nice to meet up face-to-face for a change and compare notes on pertinent subjects like cameras, blog stalkers and comment spam! More importantly, it was great to get even more of a sense of my “blog kin,” as Reya would say. I can verify that both Reya and Ched are much like their blogs. Reya is warm and gently observant, while Ched spins funny stories with ease. Reya picks up on energy in interesting ways - at one point she held a silver bracelet that I got in Morocco 15 years ago, and wear every day. "It really resonates," she said. We had lunch together and then walked through an industrial, “Mad Max” part of Chelsea (we even saw a big flashy motorcycle! ), on the way to a gallery where I left them both to go back to work. (Alas, duty called.) I showed them one of my good graffiti streets and the Starrett-Lehigh Building on 11th Avenue. I wish we’d had time to spend the whole day together, but I’m sure now that we’ve made contact, that opportunity will eventually come. We're blog kin, after all! Continuing on the recent "view from my window" theme, here's my view of the Empire State Building. I took this at dusk two nights ago. 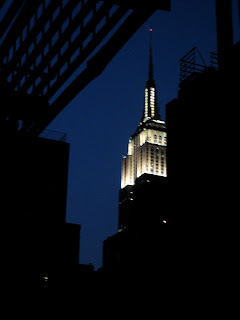 I especially like the nights when the ESB is lit with white lights - the colors change constantly, depending on the season and holidays, but I go for the simplicity of white. It's very Grace Kelly/Audrey Hepburn, as opposed to the colored lights, which are kind of Stella Stevens. 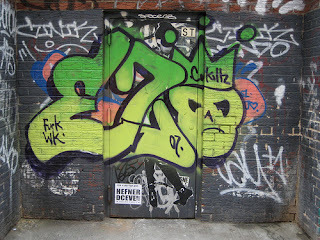 Most neighborhoods in New York City have very distinct identities. My neighborhood, on the other hand, is kind of an in-between zone. I've mentioned before that the AIA Guide to New York architecture calles my neighborhood Rose Hill, but that's an old historic name that I never hear anyone actually use. I think we should call ourselves "SoMuHi," for South Murray Hill. Rolls right off the tongue, doesn't it? 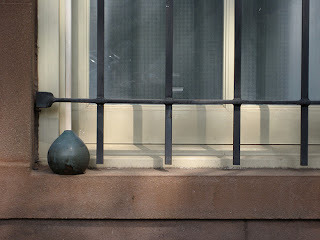 As I was walking around in Brooklyn I passed this house, with this little vase sitting on the windowsill outside. I was impressed that someone could leave something like this outside without it being stolen. Of course, who knows if it's still there! Saw an interesting movie over the weekend: "Paprika," an animated Japanese film. I've been into some Japanese animation - including nearly all of Hayao Miyazaki's movies - since I saw "Spirited Away" several years ago. "Paprika" was different - flashier and faster paced than Miyazaki, and not entirely coherent - but it was visually beautiful. The Japanese really take animation to new levels of sophistication. I especially liked the movie because it wrestled with cultural themes like the difference between reality and dreams or delusion, and the balance of oppositional influences (like the male and the female). It was also skeptical of technology. In this way it was very Miyazaki, or maybe just very Japanese. I woke up this morning to the sound of pouring rain. I heard just one persistent dove, cooing through the noise of the shower. Yes, there is actually a neighborhood called Dumbo. It's actually an acronym for Down Under the Manhattan Bridge Overpass, which pretty much describes exactly where it is. I went to an interesting talk Friday at the Zendo about koan study. As I mentioned not too long ago, I've never done koans, which are more or less Zen puzzles that allow some insight into Buddhist teachings. In fact, they intimidate me. But we did an interesting exercise in which we paired off and one person in each pair asked the other the famous koan, "What is the sound of one hand clapping?" When we gave an answer, the questioner said "thank you," and then asked the question again -- over and over, for ten minutes. You haven't lived until you've tried to answer a rationally unanswerable question over and over for ten minutes. I started with probably rather unoriginal answers like "everything," and "nothing," and by the end I was making sounds and pounding the floor. Your capacities get pushed to their limit, and the idea is to not let your mind intervene in your answer - just let it come, whatever it is. If you truly enter the koan you don't answer with your rational mind and you begin to see more deeply. I pretty much hit a wall. I did not ever leave my rational mind behind. I found myself thinking about my answers, thinking about feeling silly and how I couldn't make a certain sound because someone else in the room had made it just a few moments ago. 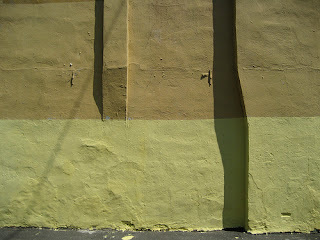 But I saw the wall, at least, which I thought was interesting. The problem, of course, is that I can't turn on the air conditioner. For now, that's fine. In July I won't be so sure. How long does it take baby birds to grow up? Meanwhile, I bought a fan. A few days ago, my blogging pal JDZS posted an article on synchronicity, Jung's word for events that seem to indicate some underlying pattern in our existence. I told JDZS at the time that I thought our lives were chaotic, that there really is no underlying pattern or organization, but that humans often build one when they look back on unrelated events and find that they seem connected. I'm doing exactly that this morning, as I look back on the past week. I mentioned my brother's dog Utah dying on Friday. But I didn't mention Sandino, the fluffy gray cat belonging to my friends John and Sue, who also died last week. And last night I learned that my friend Kevin's cat, the elegant and mischievous Sassafras, died yesterday. None of these animals were young. But there's still a measure of shock that comes with the death of a pet, no matter its age, and the fact that I've known so many trustworthy companions who died within the past week does indeed seem like some kind of unhappy synchronicity. These were the pets of our youth, the ones we adopted as we set up housekeeping in our post-college years (or in my brother's case, during college). Yesterday I mentioned my old cat Howard, who I adopted in college and who died a few years ago. My friend Sue lost a cat of similar age, Chester, around the same time. Buddha pointed out that loss is inevitable. When it happens, we can't cling. It's hard, but clinging only makes it worse. All we can do is open ourselves to the advancing years and face them with equanimity, remembering those who came with us as far as they could, and carrying them on as part of ourselves.